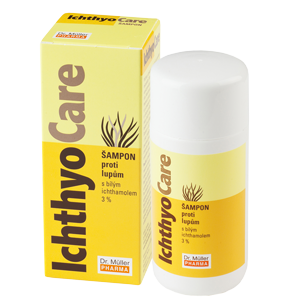 White Ichthammol, the effective agent of the IchtyoCare preparations by Dr. Müller Pharma, is a light form of sulphonated slate oil. While ammonia is used for the neutralization of common dark ichthammol, and the final product contains a not negligible amount of ammonia, white ichthammol is neutralized by sodium ions which aren’t so alien to our bodies and do not contain any free base that can irritate the skin. The advantage, then, is better solubility in water, a higher degree of purity, lighter colour and better dermatological tolerance. It is also more active against fungi and yeasts which are one of the causes of dandruff. Owing to its beneficial effect the shampoo with white ichthammol is recommended for care of the scalp in case of excess sebum production, itching and increased formation of dandruff. 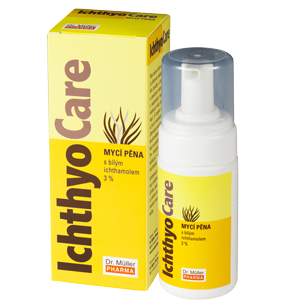 It is also effective as a supportive agent in psoriasis of the scalp. Use: Apply an adequate amount of the shampoo on wet hair and massage the skin of the scalp untill foam is formed. Let the shampoo act for some time. Then wash your hair and skin thoroughly. To reach the optimum effect, the Ichthammol shampoo should be applied 2 – 3 times a week for the period of about 4 to 6 weeks. Regular use of the Ichthammol shampoo once in a week is then recommended. 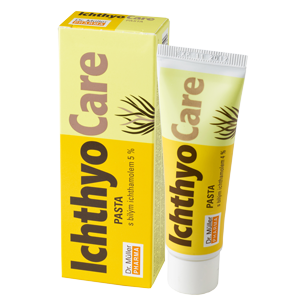 This paste with white ichthammol (5 %) is suitable as a means of aftercare for problematic skin. The product due to the presence of zinc oxide has a very good anti-itch effect. It is very well tolerated. The product does not require preservation. 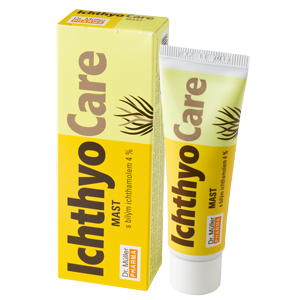 This ointment which contains white ichthammol (4 %) is recommended as a preparation for the aftercare of skin problems, skin itching and rash after exposure to the sun. It is recommended for those people whose skin may need extra moistening and lubrication. It is tolerated very well. Wash foam with white ichthammol (3 %) is a preparation for aftercare and cleaning of the skin with dermatological problems (e.g. in acne or psoriasis). It is suitable for dry skin washing and is very well tolerated in long-term use on the whole body. For optimal effect apply 2–3 times daily for approximately 4–6 weeks. The soap with 2,5% white ichtamol is a product for cleansing of the skin associated with itchy skin bearings at various dermatological disorders.